Ironically, a nation, which is riding high on various economic parameters to become the largest economy in the world in the upcoming decades, is still not able to come out from the dungeons of hunger and poverty. Whether hidden or obvious, malnutrition is India’s biggest impediment to sustained, equitable economic growth. Malnutrition still continues to be a plague for the country even in the 21st country. It is an underlying problem of India, which was expected to be rooted out speedily after Independence. Apart from poverty, factors like dietary issues, poor sanitation and low social status of women are some of the many and most likely reasons for rising malnutrition in India. As per the reports of National Family Health Survey (NFHS), nearly 40 per cent of all India’s children are either stunted or underweight and 21 per cent of them are wasted. In the dawn of 70 years of Independence, more than 58.4 per cent of all India’s children are still under the dark clouds of Anaemia. Reports presented by the UNICEF (2013) clearly indicated that under-nutrition accounts for more than one-third of child death around the world. India is still lagging way behind to secure the goal of food security as 90.4 per cent children aged 6-23 months lack adequate diet, leading to delayed cognitive development, poor livelihood and less economic output. Malnutrition is an inadequate or excess intake of essential nutrients required to meet the daily requirements of an individual. It can be classified as over- and under-nutrition. Over nutrition leads to obesity and the associated risks of non-communicable diseases while under-nutrition leads to poor physical growth and cognitive development of a child. Malnutrition equally affects children in both urban and rural areas. But in this context, it becomes very important to understand the basic difference between malnutrition and hunger. Hunger is a feeling that the body uses to signal the brain that it needs food. It generally relates to lack of food. Meanwhile, malnutrition relates to sustained lack of nutrients and vitamins that are essential for physical and mental growth and development. Malnutrition in the first 1,000 days of life can lead to irreversible damage to a child’s body and brain. In such cases, treatment and prevention of malnutrition become much important. Treating and preventing malnutrition among children builds a strong immune system, ensuring healthy physical and intellectual growth and supercharges a child’s chances of survival. At the present stage, treatment of malnutrition is possible at two levels: At the facility level, where the patient has to stay in medical treatment/nutritional rehabilitation centre for a period of 15 days and the other at the community level, where the patient can stay at home and receive treatment from health workers. At present, the Integrated Child Development Scheme (ICDS) provides supplementary nutrition, immunisation, health check-ups, referral services, informal pre-school education and nutrition and health education. 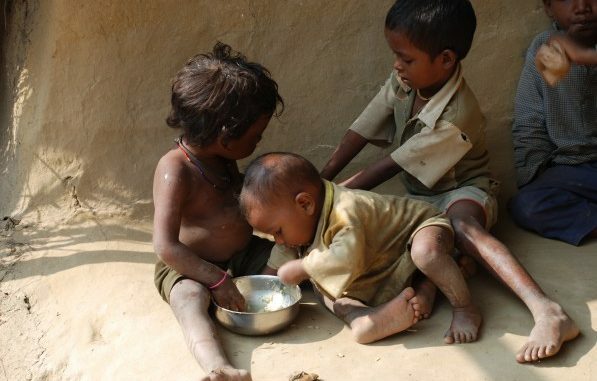 In India, Jharkhand is a leading state with regard to malnutrition. It outnumbers all other states in terms of wasting, severe wasting, underweight and anaemia. It can be correlated to 75.6 per cent households lacking improved sanitation facility. Bihar outlines 48.3 per cent of stunted children in India, which could be the result of 96.7 per cent of its women not receiving full antenatal care, which might lead to the birth of premature babies. Premature babies are low birth weight babies, which might fall for stunted physical and mental growth.